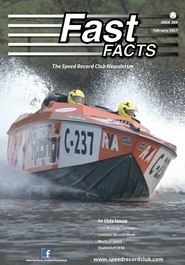 Fast FACTS is a high quality, professionally produced A4 publication issued by the Speed Record Club. • Record Breaking – What is the future? To mark the 50th anniversary of the death of Donald Campbell the Speed Record Club produced a 50 page A5 sized booklet, "Remembering Donald Campbell - The Man and his Legacy". Priced at just £5 with the profit going to local charities the booklet is available for sale locally in the Coniston, Cumbria area now and via mail order.